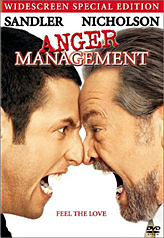 On the main menu of Anger Management, select the Set Up menu option. Once you are in that menu, highlight English and press your Up button on the remote. The eyes and nose on the cat-shaped ink blot should light up green. Select this to view a 3-minute behind-the scenes footage including problems with the artificial rain machine. To access this egg go to the "Special Features""menu on your Anger Management DVD. Once there, access the deleted scenes. In this menu, highlight "Candy Store" and press your Up button on the remote. One of the buttons on the electric shaver ink blot should light up green. Select this to see a 15 second clip of Adam Sandler feeding his dog Meatloaf and telling a joke.